In recently holding a collaborative partner roundtable at ARN headquarters, cutting through the core issues of the day, four words dominated conversation; Science, Technology, Engineering and Mathematics. To be blunt, Australia’s future will undoubtedly rely on STEM - disciplines at the core of innovation. Yet while the critical importance of forward movement is clear, the industry knows very little about who possesses these skills in Australia, where they work or how their careers progress from graduation. Critical to creating competitive advantage, enabling the workforce of the future and managing ongoing work in research and development, such skills are becoming the lifeblood of emerging knowledge- based industries such as technology. As a 25-year-old tech publication, we want to know what makes a 25-year-old Australian tick. Setting the STEM agenda in this issue is a core group of channel partners, impacted directly by the ongoing skills shortage. ARN Journalist, CHRIS PLAYER, peels back the layers of the government’s skill shortage agenda. Somerville Group founder and CEO, Craig Somerville, sat down with ARN journalist, CHRIS PLAYER, to assess the long-lasting impact of skill shortages on the channel. TasICT CEO, William Kestin, uncovers issues with the current curriculum in Australia with ARN Deputy Editor, HAFIZAH OSMAN. The STEM shortage is becoming a critical issue. 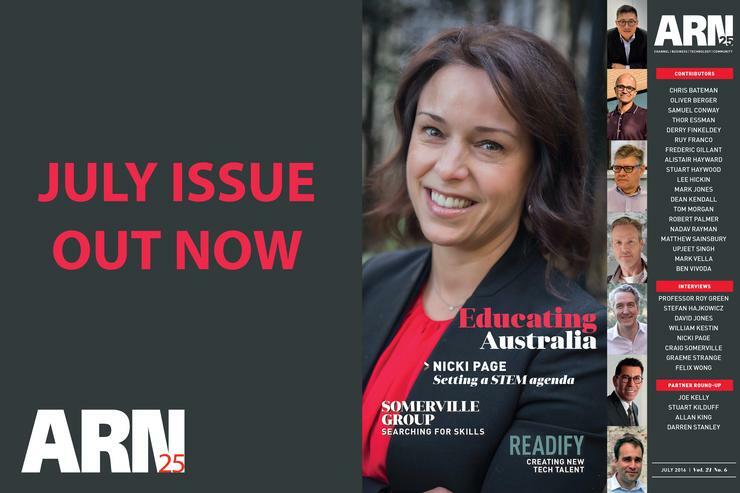 ARN Editor, JAMES HENDERSON, asked MOQdigital CEO, Nicki Page, how to educate a nation. ARN Editor, JAMES HENDERSON, goes behind distribution lines with newly appointed Ingram Micro Chief Country Executive A/NZ, Felix Wong. ARN Journalist, HOLLY MORGAN, quizzed Readify Managing Director, Graeme Strange, on how to create the next generation of tech talent. ARN Editor, JAMES HENDERSON, connected with University of Technology Dean of the UTS Business School, Professor Roy Green, to assess Australia’s innovation impasse. Can Microsoft make money from LinkedIn? Following Microsoft’s $US26.2 billion acquisition of LinkedIn, ARN Editor, JAMES HENDERSON, attempts to monetise the network. Is selling Dell Software smart? Does Dell shedding Quest Software and SonicWall make strategic and financial sense? Are partners prepared for the next wave of security? This ARN Roundtable of key vendors, distributors and partners asked who’s driving the security conversation in Australia, removing facts from fiction as the industry prepares for a new wave of security threats. ARN Deputy Editor, HAFIZAH OSMAN, identifies the emerging trends impacting the ever-changing printing industry, assessing the new technologies disrupting the market. Who and where is Australia hiring? IT recruitment specialists, Robert Half, identify the top tech hotspots across the country. Each month this column looks at partners on the upward move – these are the companies to watch. As the capital city of Australia, ARN senior journalist, JULIA TALEVSKI, assesses the challenges and opportunities in Canberra.